The MMX 1000 Series mixer is primarily a Drum Mixer or Barrel Mixer. For light duty or small tank applications we also offer the MMX 2000 Series mixer. The MMX 2000 Series offers economy in larger applications. The MMX line is largely focused on small volume 45, 50 or 55 Gallon Drum Mixer applications. Also known as a Barrel Mixer this line of mixers can be adapted to larger applications when light duty or economical solutions are required. Barrel Mixers and 45 – 55 Gallon Drum Mixers are our smaller mixer line, but Dynamix has applied the same level of design innovation in order to adapt to your barrel or drum. 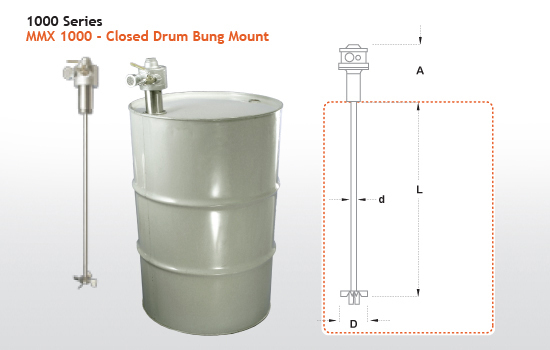 For closed head drum tanks that have a 2″ NPT port we offer our Bung Mount Mixer. This mixer is specifically designed to enter a closed head drum tank and provide increased mixing via collapsible impellers. DYNAMIX AGITATORS ARE CONFIGURED AND SELECTED ACCORDING TO YOUR NEEDS. THESE IMAGES AND CONFIGURATION OPTIONS ARE ONLY GUIDELINES TOWARD YOUR FINAL MIXER SELECTION.